Rabbi Yitzchak Chinagel has an unusual hobby: he has made it his life’s mission to find the Ten Lost Tribes of Israel. His investigations have taken him to northern China twice, but both trips had to be abruptly aborted. Rabbi Chinagel is not ready to give up, however, because his quest is not fueled by mere curiosity, but by far loftier ideals. When he met two Pakistani teenagers at the northern border of China, Rabbi Yitzchak Chinagel was certain that he was about to receive yet another confirmation of what he had long suspected to be the case. Although they looked and acted like Muslims, these teens originated from a town deep in Pakistan – an area where, Rav Chinagel feels certain, hundreds of thousands of descendants of the Ten Lost Tribes ofIsrael live today. The Ten Tribes (Aseres HaShevatim) were exiled by Sancheriv, King of Assyria, before the destruction of the First Beis HaMikdash, as a Divine punishment for idol worship. But Rashi in Maseches Sanhedrin (110b) writes that only that first generation had actually worshipped idols; subsequent generations were righteous. After Sancheriv’s death, explains Rabbi Chinagel, substantial numbers decided to move out of the areas in which Sancheriv had forced them to settle, in order to avoid assimilating into the surrounding non-Jewish population. The search for the Ten Tribes has become a lifelong obsession for Rabbi Chinagel. He relates that during his childhood in Tzfas, he once came across the sefer Eldad HaDani, written approximately a thousand years ago by a traveier who introduced himself as Eldad from the tribe of Dan. He describes the kingdom he originated from, writing that the tribes of Dan, Naftali, Gad, and Asher live together in that land with the Bnei Moshe. He also mentions the Sambatyon River. This sefer is known to be a reliable source quoted by many Rishonim, including the Rashba and the Ran, who clearly respected Eldad, even though they argued with some of his rulings. Eldad was an outstanding talmid chacham, and wecanrely onhis descriptions of his childhood home and his life with the other tribes. The kingdom he came from clearly knew the Oral Torah, because he was well-versed in Talmud Bavli. There was one issue that raised suspicions among those who read his sefer, however: He has many chumros in the area of shechitah insisting, for instance, that if an animal is slaughtered by a shochet who has not first immersed in the mikveh, it is considered a neveilah, and that this “was taught by Yehoshua, who heard it from Moshe, who heard it from Hashem.” Since this practice is clearly a chumrah, it is odd that Eldad should attribute it to Yehoshua. Rav Tzemach Gaon suggests that since Eldad suffered greatly at the hands of cannibals and fire-worshippers on his journeys, he might have become confused and mistaken a tradition for halachah. The boy went on to explain that all the members of his tribe know of their secret origins. He told Rabbi Chinagel which “beis av” he came from, and related that as a child, he had even had 10ngpEYos. All the young boys in the tribe have PEYos, which are cut when they reach adulthood so that the Muslims around them won’t suspect that they belong to a different nation (or religion). The Pashtuns account for the children’s PEYos by explaining that they are grown to ward off the ayin hara – a concept that the Muslims also believe in. Reb Amir Dromi, one of the people who accompanied Rabbi Chinagel on a trip to China, relates that deep in the recesses of Afghanistan, there are adults among the tribes who also have PEYos. It was the elusive Bnei Moshe tribe that brought Rav Chinagel to China two years ago. He wanted to locate the mysterious Sambatyon River, because the assumption is that the Bnei Moshe live on the other side of it. The Sambatyon is referred to in Torah literature as the raging river that is untraversable during the week and tranquil on Shabbos. The Ten Tribes, it is written, were exiled beyond the Sambatyon. The trip was inspired by the sefer Kol Mevaser by Rav Shimon Horowitz, one of the founders of Yeshivas Shaar HaShamayirn in Jerusalem. The sefer suggests that the Sambatyon River is located in a desert region in northern China. Rav Yisrael’s second goal in writing to the Bnei Moshe was to request that dayanim smuchin, judges with true smichah, be dispatched, for the Geulah is dependent on having dayanim smuchin in Eretz Yisrael. Rav Baruch accepted the mission and went in search of the Ten Tribes, with instructions not to involve himself in anything else along the way. But he ended up being called on to help an ailing king in Yemen, and was later killed when that same king had a fit of anger. The letter was never delivered. Rav Chinagel has collected a vast amount of information about the various people who went in search of the Ten Tribes, some of which he has published in Mevakshei Torah journals. This testimony inspired Rabbi Chinagel and his companion to press on with their search. It seemed that there was still a long journey ahead of them, in a sparsely populated, mountainous area. They prepared themselves for a journey up the mountain on donkeyback. Would remnants of the lost tribes who are discovered be accepted as Jews without any further questioning? The answer depends on how the tribe’s Judaism manifests itself. Many of these tribes claim that they haven’t intermarried with the surrounding non-Jews throughout their years in exile. However, since they have forgotten many fundamental halachos, each group must be examined by a beis din, and most would require giyur 1 ‘chumrah, conversion as a stringency. The Beta Israel Ethiopians, for example, were required to undergo giyur l’chumrah. The conversion of the Bnei Menashe of India was much more serious, because they came in with much less knowledge regarding their roots. Rabbi Chinagel’s ultimate goal is to find a tribe that knows the entire Torah and observes it fully, without having made any changes during their exile. So far, no such tribe has been discovered. But he remains optimistic, citing Rav Yisrael of Shklov’s belief in the existence of such a tribe. And although he plans to continue his quest, he’s not sure that he’ll travel again to the Far East. “I believe that I may have received a message from Heaven that it’s just not time yet,” he concedes. In the meantime, he’s keeping his eyes open and his hopes raised for the day when we will discover our brethren on the other side of the Sambatyon, the day of the ingathering of all the exiles, when Hashem’s Sovereignty will be accepted by all. _ A Messenger to Shaar HaShamayim Exactly one hundred years ago, in 1910, a man dressed like a Bedouin appeared near Petach Tikvah. Looking for Jews, he stumbled upon an Arab village. The Arab sheikh directed him toward Petach Tikvah. Following his directions, the man went off, but returned a short time later. “I asked for Jews, and you sent me to Christians!” The sheikh convinced him to return to Petach Tikvah and talk to the Jews there in lashon hakodesh. Sure enough, the man was thrilled to discover Jews who observed Torah and mitzvos. He later explained that the Jews he’d seen initially were dressed in a very modern fashion and were clean-shaven. It was hard for him to believe that they were actually Jews, because he had never seen anyone like them in his hometown. When he was asked where he came from, he revealed only that he lived far away and had gotten lost in his travels. The lost Jew requested a job so that he could support himself. He was assigned to guard the fields from marauding bands of Arabs who would steal tools and crates of produce. He patrolled the fields on horseback each night. One day, he saw a group of robbers approaching. Overtaking them on his horse, he grabbed the leader and strangled him with his bare hands. The rest of the robbers fled in panic. The local Jews realized that this strange man was different in some mysterious way. Not only was his physical strength beyond compare, but his yiras Shamayim was also on an outstanding level. After a while, the man began to ask where he could find people who learned Kabbalah. He was directed to the Shaar HaShamayim yeshivah in Jerusalem. Once there, he related that he was descended from the Bnei HaReichavim and a messenger of the Bnei Moshe, and that he had arrived in Eretz Yisrael to bring the Geulah closer. He journeyed to many kivrei tzaddikim and spent much time speaking to the kabbalists in the yeshivah, but the subjects he discussed were kept secret. The only details he allowed them to publicize were that his name was Yosef ben Achim HaReichavi, and that he came from a place near the Sambatyon to speak to the mekubalim in Eretz Yisrael. When stones engraved with Hebrew letters were unearthed from mounds in North America during the 1860s, they stirred a debate as to whether Jewish descendants of the Aseres HaShevatim were in the Americas before the American Indians arrived. But before dealing with that theory, we must first determine: Were those stones actual ancient artifacts, or were they planted in the mounds? In certain parts of the United States, one encounters a very strange phenomenon: large mounds of earth, often covered in grass. Many of them are simple cone-shaped mounds, but some are more elaborate. There are mounds in the shapes of animals, including the most famous: the “Serpent Mound” in southern Ohio, an image of a snake that wends its way through an open expanse for some 1,330 feet. Scientific studies show that some of the mounds were built nearly 1,000 years before the Egyptian Pyramid s, and the last mounds were built in the sixteenth century. Many of the mounds were used for burial, but others were temple mounds, serving as platforms for religious structures. Hernando De Soto, a Spanish conquistador who spent the years 1540 through 1542 traversing most of what became the southeast United States, reported encountering many different mound building peoples. When European explorers and settlers reached North America, they theorized that the indigenous American Indians were not sophisticated enough to construct such mounds, so they referred to the unknown people who did – appropriately enough – as the “Mound Builders.” It seems, however, that they were wrong; at least some of the mounds were indeed built by American Indians. Digging in the mounds often unearths objects that provide insight into the lives of their builders. Considering that Jews are known to have first set foot on American soil at the turn of the sixteenth century – as mound building was coming to an end – the last thing anyone would have expected to find when digging in a mound was an object associated with Jews. Yet that is exactly what happened at a burial mound south of Newark, Ohio. David Wyrick of Newark, Ohio, was a printer by trade, and he dabbled in ancient languages (1). Wyrick took an interest in the remains found in the ancient mounds, and he took part in archaeological digs in them. In June 1860, in a mound approximately one mile southwest of Newark, he found a wedge-shaped stone. The stone is nearly six inches long, and while it is three inches wide at its widest end, it is tapered at its narrow end to a flattened surface approximately half an inch in diameter. There is a handle at the other end. Shockingly, there is a clear Hebrew inscription on each of the four sides of the stones. The inscriptions are: Melech Eretz – King of the Earth; Toras Hashem the Torah of G-d, D ‘var Hashem – the Word of G-d; and Kodesh Kadoshim – Holy of Holies. Because of its shape, this stone was named the “Keystone.” Needless to say, this “find” created a considerable stir. At the time, many Christians in the US were convinced that the American Indians were descendants of the Aseres HaShevatim, the Ten Lost Tribes of Israel(2). The Keystone, which would seemingly have been in that mound well before any European Jew set foot on American shores, substantiated that belief. That November, Wyrick made an even more striking discovery. While excavating with a team of workers ten miles south of Newark at the Jacksontown Stone Mound, he unearthed a small stone “casket,” eighteen inches long and a foot wide. Inside the casket was a slab of stone 6 7/8 inches long, 1 5/8 inches thick, and 2 7/8 inches wide. On one side of the slab is a carved figure of a person in a turban and priestly robes. The word “Moshe,” in clear Hebrew lettering, appears above this carving. An arched border runs down both sides of the stone to its base. There is a round handle at the base of the slab, and an empty space, where perhaps a strap could be inserted into the stone. The text of the Aseres HaDibros (Ten Commandments) is engraved into the border, beginning at the top, over the head of “Moshe,” running down the left side of the front, winding around every available space on the back and sides of the slab, and then coming back up the right side of the front of the slab and ending exactly where it began. Remarkably, no letters are stretched or condensed – quite a feat for the engraver. 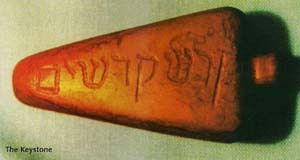 The Hebrew writing on both stones is not in kesav ivri (the script known as pre Exilic or paleo-Hebrew), used by Jews in earlier times, but in some version of kesav as huri ( also known as post-Exilic or Imperial Aramaic Hebrew), which came into popular use in the times of Ezra HaSofer (circa 336 BCE). This has obvious implications on the dating of these stones. But interestingly, while the letters engraved on the Keystone are exactly the same as the kesav ashuri we use today, only a few of the letters on the Decalogue Stone match those we use today. Another oddity on the Decalogue Stone is that it does not have the complete text of the Aseres HaDibros. The First, Sixth, Seventh, Eighth, Ninth and Tenth Commandments are written exactly as they appear in the Torah in Paras has Yisro. The Second Commandment reads: “You shall have no other gods before Me. You shall not make for yourself any graven image nor any [words missing]. You shall not bow down to them nor serve them.”Only the first half of the Third Commandment, “You shall not take the name of the Lord your G-d in vain” appears. In the Fifth Commandment, only the words “Honor your father and your mother” are etched into the stone. We can only wonder why the person who engraved the stone skipped the missing words. The last find was in 1867, three years after Wyrick died, when banker and amateur archaeologist David M. Johnson and his colleague, N. Roe Bradner, MD, of Pennsylvania, found another stone, in the same Jacksontown Stone Mound in which Wyrick had unearthed the Decalogue. The original stone is lost, but a lithograph, published in France, is extant (4). The letters on the lid and base of the Johnson-Bradner stone are in the same peculiar alphabet as the Decalogue inscription, and appear to wrap around in the same manner as on the Decalogue’s back platform. The independent find of a stone bearing the same unique characters as the Decalogue Stone seems to confirm the authenticity of Wyrick’s artifacts. Historic Find or Historic Hoax? When the “Holy Stones of Newark” were found, they stirred excitement in both archaeological and religious forums (5). Initially everyone believed that they were authentic Judaic relics. With time, however, archaeologists began to question their authenticity, and many declared the “findings” to be a hoax concocted by Wyrick. But there is overwhelming evidence that indicates that Wyrick did not create these stones. In 1861, Wyrick published a pamphlet with his account of the discoveries. He included woodcuts that he carved, which were meant to replicate the inscriptions on the stones. A careful comparison of Wyrick’s woodcuts of the Decalogue to the actual inscriptions on the stones shows that out of 256 letters, Wyrick made no less than thirty-eight significant errors, either mak­ing a legible letter illegible, turning a legible letter into a different letter, or omitting the letter altogether. Whoever carved the Decalogue stone had only rudimentary knowledge of Hebrew and made a few errors in copying the Aseres HaDibros, but Wyrick added another series of errors to his carvings. He clearly did not even understand the inscription’s peculiar, yet consistently applied, alphabet, and therefore could not have been the one to engrave. 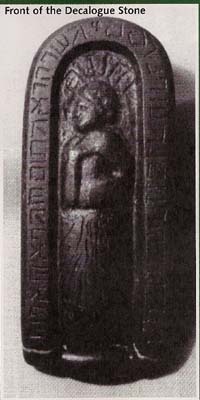 Furthermore, on the Decalogue Stone, Moshe is wearing a turban and flowing robe, seems to be either holding a tablet or wearing a breastplate, and has fine features and a mild expression. Wyrick’s Moshe, on the other hand, glares out from over a projecting nose, is wearing a beret, a nineteenth-century-style robe, and a minister’s ecclesiastical shawl. Beverley H. Moseley, Jr., the former art director of the Ohio Historical Society, compared the stone carving of Moshe to Wyrick’s woodcut copy, and opined that the same person could not have made these two images. On the other hand, Harvard University’s Dr. Stephen Williams, Peabody Professor of American Archaeology and Ethnology Emeritus, and honorary curator of North American archaeology at the Peabody Museum of Archaeology and Ethnology, claims that Wyrick had already been committed to the theory that the Mound Builders were descendants of the Lost Tribes of Israel prior to his discovery of the Keystone. The implication of Dr. Williams’s suggestion is that Wyrick may have fabricated the Keystone and Decalogue to support his own theory. Williams’s theory is hard to substantiate, however, because Wyrick’s alleged obsession does not appear in any of his ex­isting correspondence – not even in the pamphlet he wrote about the stones. At the time of the Keystone discovery, Wyrick was described merely as an “enthusiast for natural science,” whose interests included geomagnetism, anomalous boulders, river terraces, beaver dams, and sorghum processing. Furthermore, the Aseres HaShevatim (and, by extension, their descendants) would have used kesav ivri, not ashuri, which was only adopted for common use later on. The fact that kesav ashuri, in two variations, appears on the stones, seems to rule out any connection to the Aseres HaShevatim. Had Wyrick sought to stage these “findings,” therefore, he would not have done so by carving letters that could not have been used by the descendants of the Aseres HaShevatim. In recent times, a new theory has emerged. In 1999, Bradley T. Lepper, a curator of archaeology for the Ohio Historical Society, came up with the idea that a Reverend John W. McCarty and stonecutter Elijah Sutton joined forces to create the Keystone and Decalogue Stone, and then planted them in a place where Wyrick would find them. Lepper, convinced that the stones must be frauds, based his claim on circumstantial evidence: that Rev. McCarty knew how to read Hebrew and was able to quickly decipher the inscription despite its peculiar alphabet, and that Elijah Sutton was the stonecutter who carved many Newark tombstones during that periodincluding Wyrick’s – and the stones Wyrick “unearthed” are approximately the same thickness as a typical Newark tombstone of that era. Lepper’s theory does not hold much water. Although McCarty was indeed able to publish his translation of the Decalogue stone just a few days after its discovery, such a translation would be no more diffi­cult for a well-trained nineteenth-century minister than it would be for an American history student to decipher a famous American historical document that has had half of its letters replaced with even entirely arbitrary symbols. Once a few words are identified, the other symbols fall into place. Moreover, a few days after publishing his first translation of the Decalogue, MeCarty published a second one to correct some initial errors. In the first article, for example, he had misread the letters of Moshe as mem-shin-ches, which he assumed were meant to spell Mashiach. As any good Episcopalian minister would, he concluded that the carver figure represented “the messiah” (the founder of McCarty’s religion). He corrected that error in the second translation, identifying them as mem-shin-hey, Moshe. Had McCarty composed the text on the stone himself, he would certainly have gotten the translation right on his first try, particularly on such an important (and, in retrospect, obvious) point. Therefore, Lepper’s hypothesis that McCarty must have composed the text of Wyrick’s finds simply because he was the first Hebrew scholar on the scene seems to be implausible. For some reason, a report issued in 1863 by a committee appointed by the Ethnological Society, which states that they accepted Dr. Fischel’s assessment, was ignored by other scholars examining the Holy Stones. They entertained only two possibilities: that the artifacts were evidence of the presence of the Ten Lost Tribes ofIsrael in “Ancient America,” or that they were modem forgeries. Dr Altman suggests that Dr. Fischel’s assessment was ignored because it didn’t fit with the theories that modem studies of the cases were willing to accept. But no one entertained the possibility that perhaps the artifacts were real, but did not bear witness to the existence of the Lost Tribes in the United States. Dr. Altman presents a comprehensive and novel explanation of what she believes the Newark Holy Stones may have been. When examined through Torah-true lenses, much of her theory is far-fetched and implausible. But her work is interesting nonetheless because it counters many of the previously accepted theories. She suggests that four of the stones unearthed comprise two sets of ritual artifacts, and the fifth item is a case, made to-order, to house one of the ritual artifacts.1 One set of artifacts is a pair of traveling “tefillin” made of black limestone. She says that they made it out of stone to ensure that it would stay pure (tahar), but it was black because its creator knew that tefillin must be black. The tefillin she! rash was the Johnson-Bradner Stone (the stone that is lost, and only a lithograph remains), which, she suggests, is inscribed with two of the four parshiyos (portions) of Shemos that are written in tefillin, and is written in the spirals of an incantation format that was used in ancient times. The tefillin shel yad was the Decalogue Stone, which Dr. Altman suggests contains a variant of a known condensed version of the Ten Commandments that predates the second century BCE. But from a halachic standpoint, her explanation of the why the Ten Commandments would appear on tefillin she! yad is implausible. The second set of artifacts, made of a very hard, fine-grained rock called novculite, consists of the Keystone, which she says was used as a flow detector to determine whether water was stagnant or flowing (this would have implications on their halachic viability for use for purification); and a bowl used to wash hands for ritual purity prior to donning tefillin. Dr. Altman delves into a complex explanation of how the stones could have reached the mound in Ohio. She suggests that the artifacts were created at some point between the eleventh or thirteenth centuries, probably in Spain, but perhaps in France. They were brought to the Americas by a European settler, who, she claims, was killed while wearing his she! rash (which was found connected to a skull that bore signs of being struck by a blunt object), and the Keystone was stolen by the murderer for personal use. By the time he realized that he did not have any use for it, he was a mile from what is now Newark, Ohio, where he deposited it in the mound where Wyrick found it. “The artifacts could not possibly have been created in the nineteenth century [as theorized by those who believed that they were created by either Wyrick or McCarty and Sutton -Ed. ], because nobody had the knowledge necessary to do so. Indeed, nobody who previously examined these artifacts has recognized that two of the artifacts are inscribed in the ancient incantation format. Nor has anyone previously realized that the ‘peculiar’ font is a consolidated design, or that it is a grid font typical of scripts and fonts used with incantation formats. It is rather clear that no one until today has recognized the late-medieval Hebrew script that is the base-script of this consolidated grid font. There are obvious difficulties with Dr. Altman’s theory, the most important of which is why the person who created the “tefillin” would have made them out of stone, which, while certainly retaining purity as she suggests, would not be viable as tefillin altogether. The mystery is, therefore, unresolved . 1 This section is based on the essay “Are There Traces of the Ten Lost Tribes in Ohio?” by David Philipson, Publications of the American Jewish Historical Society (1893-1961); 1905; 13,AJHSJournal. 2 James Adair’s book, The History of the American Indians, published in London in 1775, offers twenty three arguments to support the theory that Native Americans are descendants of Jews. 3 This bowl was missing for a long time, but was found recently in the storage rooms of the Johnson Humrickhouse Museum by Dr. Bradley Lepper of the Ohio Historical Society. 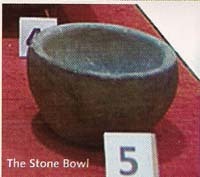 4 The Keystone, Decalogue Stone, and the bowl are on permanent display at the Johnson-Humrickhouse Museum in Coshocton, Ohio. 5 This section is based on The Newark, Ohio,_ Decalogue Stone and Keystone, available at http:// http://www.econ.ohio-state.edu/jhm/arch/decalog.html. 6 This section is based on “First, Recognize That It’s A Penny: Report on the ‘Newark’ Ritual Artifacts” by Rochelle 1. Altman, The Bible and Interpretation (an online journal), Jan. 2004. I am sorry I do not have this information. A great number of the Irish Celts have an Oral tradition and say they are one or part of one of the Lost Tribes. Having my YDNS tested shows 90% + Celt, but one part of the 10 to 8 % shows and the oldest Jewish! I have found other persons who are Irish that also have old Jewish DNA. You mentioned the Americans who had searched for the list tribes 35 years ago. Is that a reference to the group from Lakewood. In any case i am looking for more infotainment about excursion. I once heard a cd on if but can’t seem to find it. I do not know any further details so far.